Monday, February 13, 2012: As we reluctantly leave Tucson, the realization is beginning to set in that this year, unlike the past three Excellent Adventure trips, we will not be visiting our childhood hometown of San Diego. We love returning home to poke around the old neighborhood and beachside haunts, and we love visiting our friends and relatives even more. However ongoing family needs cause us to take a different path this year……hope all in SoCal understand. We miss you! 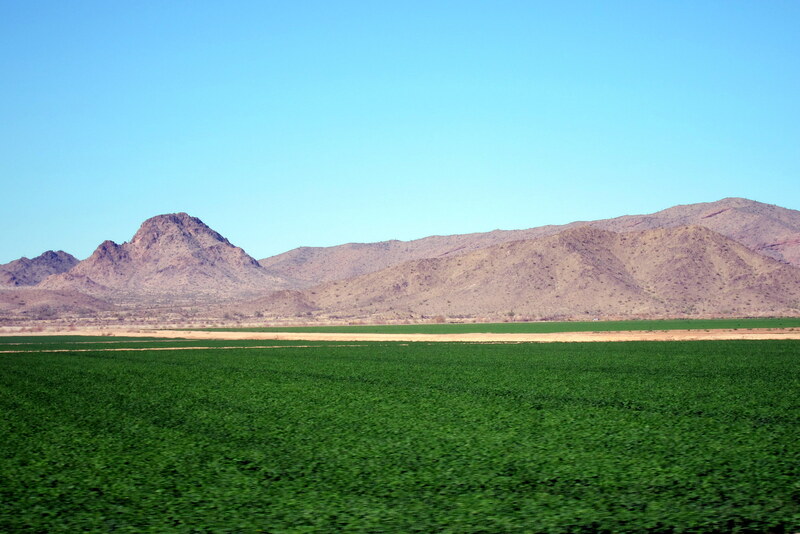 Heading north on I-10 we pass our old landmark Picacho Peak. How would you like to climb that sucker, there grandson Joe? This 3,300 foot spire rising from the surrounding desert is another example of redundant naming. 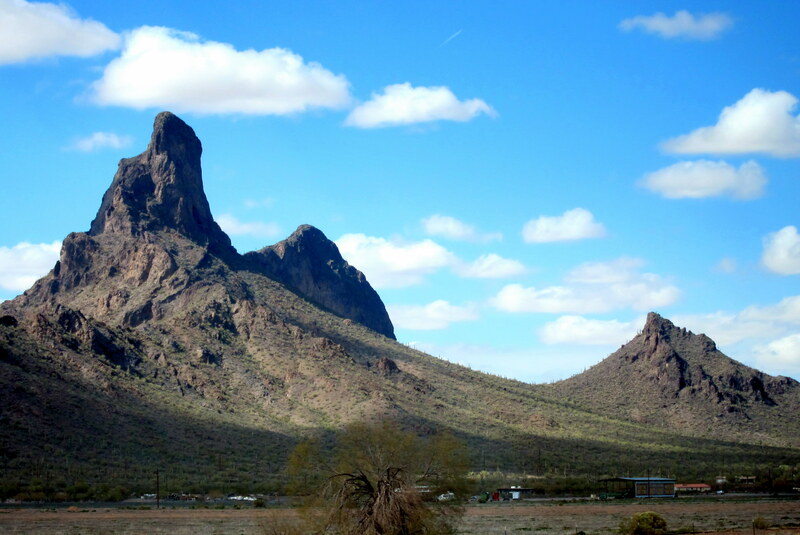 Picacho means Big Peak in Spanish…..so Picacho Peak technically means Big Peak Peak……kinda like Mount Kathadin in Maine which means Mount Greatest Mountain in the native Abenaki language. There is a semi-technical via ferrata trail to a small flat spot near the peak for the fit and adventurous. I’m neither, but I would love to attempt the climb at some point anyway. Stopped in Casa Grande to fuel and resupply at The Wal*Mart. We then headed west on I-8 toward the setting sun before exiting on US-85 South toward Gila Bend. 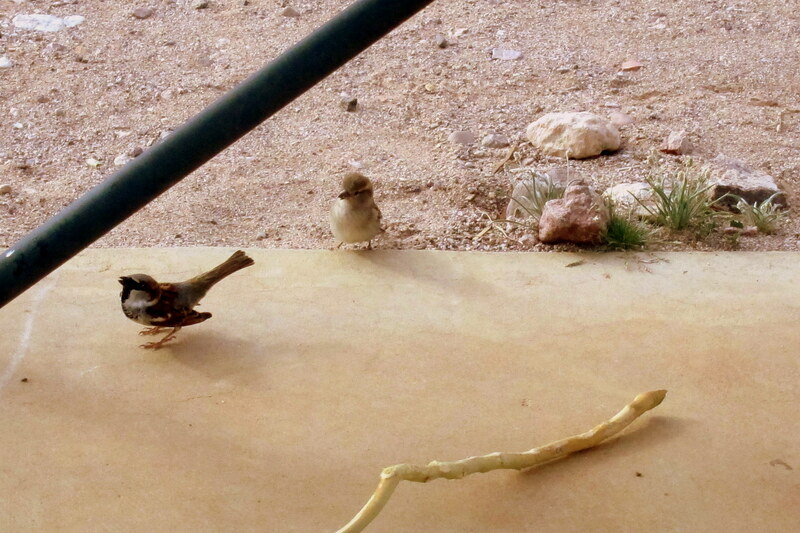 On the exit ramp, I had to make a quick evasive move as a Roadrunner darted in front of the truck. Not the Plymouth type but the flightless bird type, well actually it used to fly until the TSA started making it take of his little shoes. The poor fellow almost became a Roadrunover and Wile E Coyote would finally have had his day. After a pleasant but short drive toward nothingness, we rolled into the Gila Bend AFAF at 1545 and made our way to the campground for the night. Tuesday, February 14, 2012: Woke to warm sunny skies and not much else. Gila Bend AFAF (Air Force Auxiliary Field) is a satellite facility of Luke Air Force Base in Phoenix. 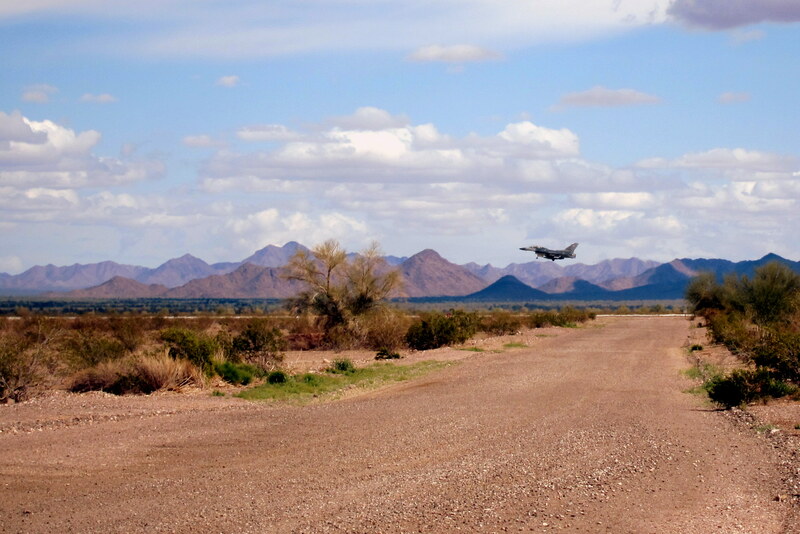 It can best be described as a military ghost town…..even the Air Force left and turned the operation over to civilian contractors. 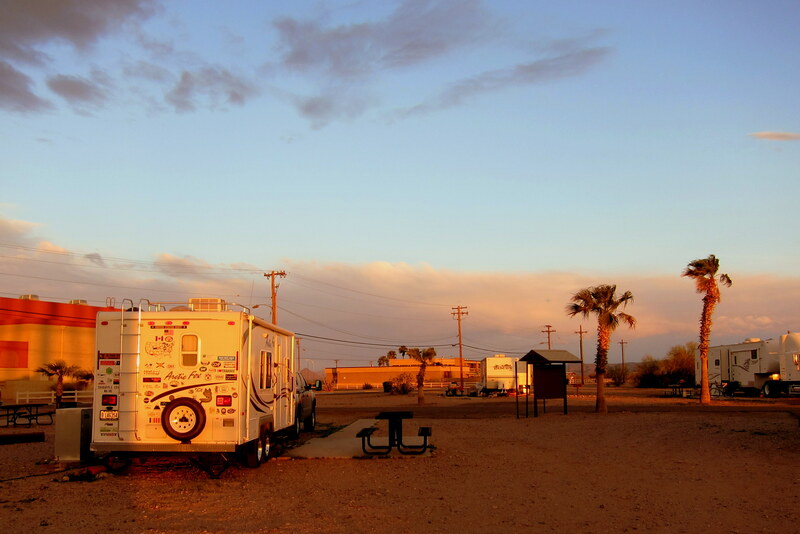 The campground is located in the old abandoned mobile home park so each site has tons of room and features full hookup’s for only $7.00 a night! Here is the road into the base. Here is the road into the campground. 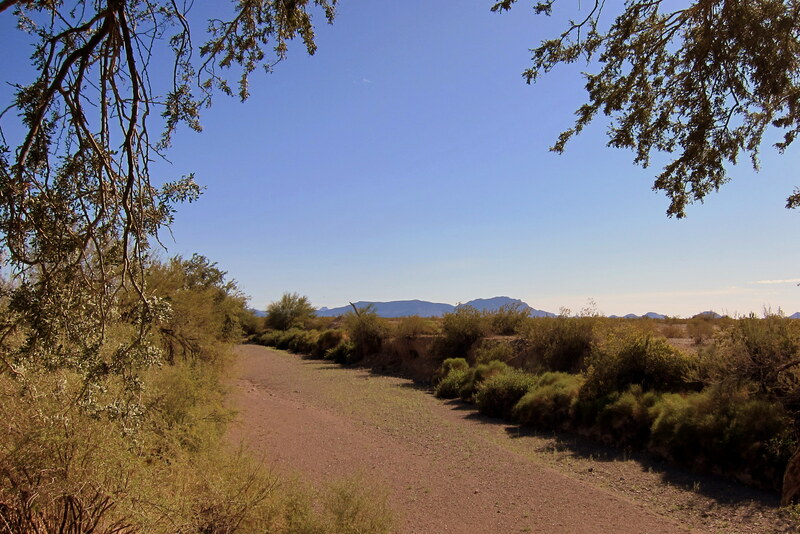 Here is the Gila River. And here are our neighbors. There is no office, no registration building, no bath house and no camp host. Fortunately the few hermits that winter over here are very helpful and made sure we knew what to do. There is a metal shed with a couple of washers and dryers that are free to use and where the “special key” to turn on the water is stored. 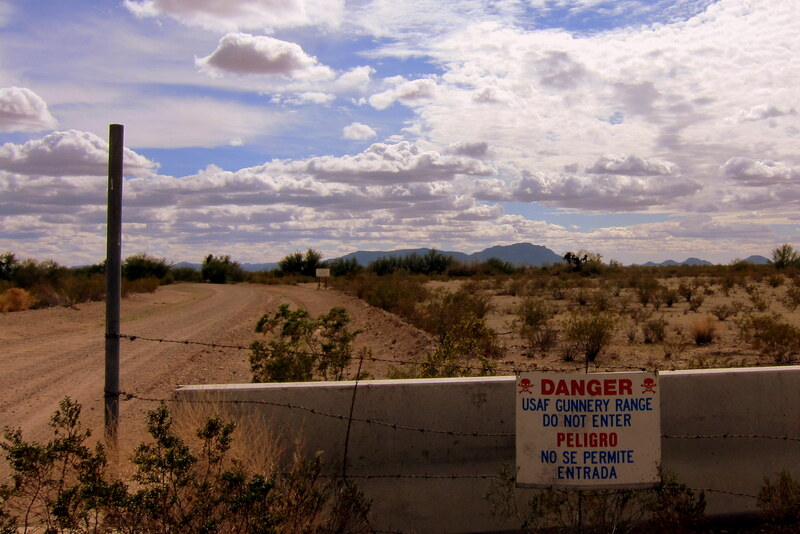 Why a special key…..well apparently the remoteness of this area make it an ideal corridor for illegals heading to jobs in Las Vegas and since the water is unhealthy the government doesn’t want these undocumented workers getting sick on their journey. Oh yea….. 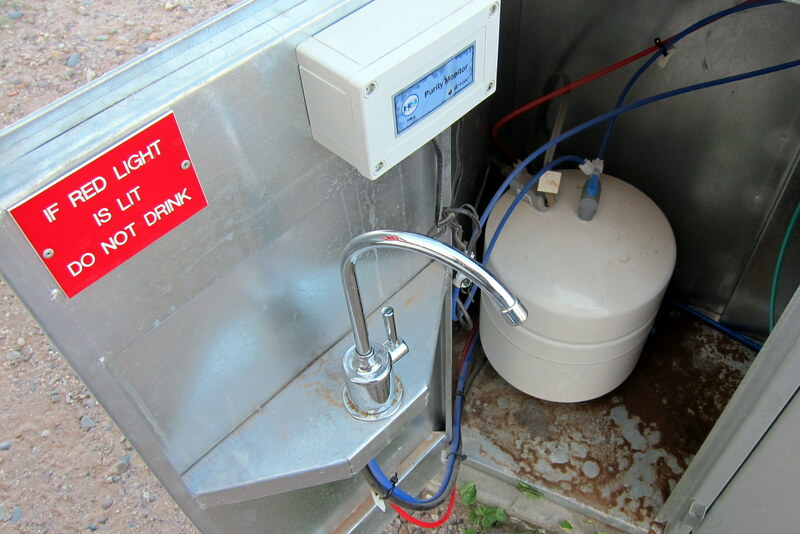 Here is our individual campsite reverse osmosis water treatment unit, no key required. We stared at the red light, a lot. Apparently the ground water is a tiny bit contaminated……gee, I wonder why? So…..why is there little here? And why did the Air Force move all their personnel out and deactivate the base? 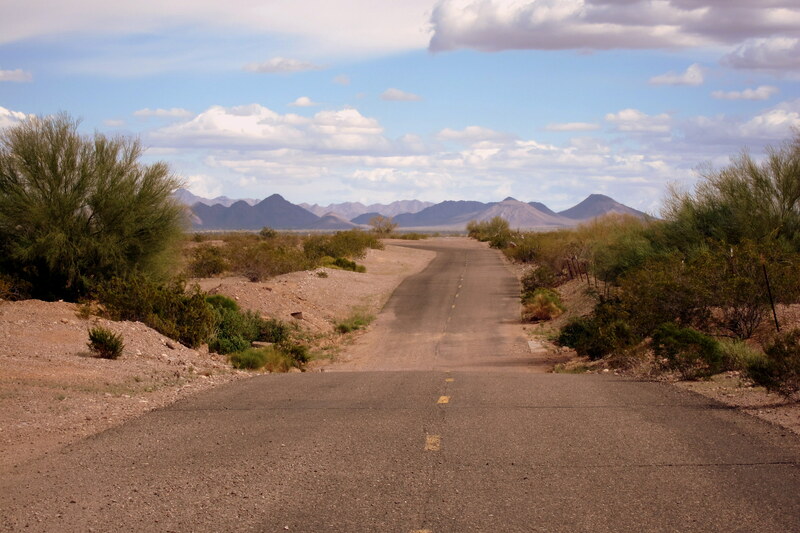 Well…..Gila Bend AFAF happens to be smack dab in the middle of the Barry M. Goldwater Bombing Range. So the only folks left to be in danger are a few hapless defense contractors and a bunch of pensioners living in their RV’s, who by the way, are long past their childbearing years……so I guess are not in any environmental danger. There is one lone remaining runway where bomb laden jets do incessant touch and go’s before heading out on the range to turn sand into glass. The runway is also used for training pilots in risky approach maneuvers including an emergency procedure called dead stick……I don’t even like the name of that! Well, what do we decide to do in this God forsaken place? Why stay a few days of course! After all, $7.00 a night for full hook up’s is a bargain…..even if our lives are continuously in imminent danger. Wednesday, February 15, 2012: Up late because, well frankly there is little excitement to look forward to. However I did take advantage of this down time to fix a few things on the truck, trailer and bicycle. Speaking of bike’s there is a multi-use trail that meanders about in the desert. Without the rocks defining the trail one could easily wander into the wrong areas. However, I guess the Air Force pilots like having a moving target scurrying about the bombing range. As I popped off the trail and onto a dirt road, This sign did give me cause for concern…..the gate was open, but I decided to turn back toward camp not being sure whether those were clouds or puffs of smoke. 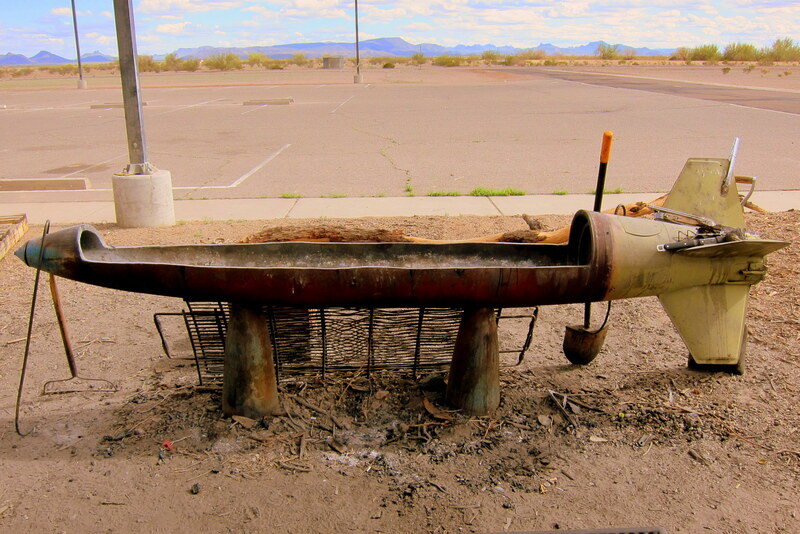 Back at the campground, I came across this rather unique barbeque pit. I guess this one came a little close so the resourceful snowbirds turned it into something more useful. Imagine the first person lighting the old briquettes in that thing? The parking lot in the above picture is surrounded by cement slabs where buildings once stood before the Air Force moved out. 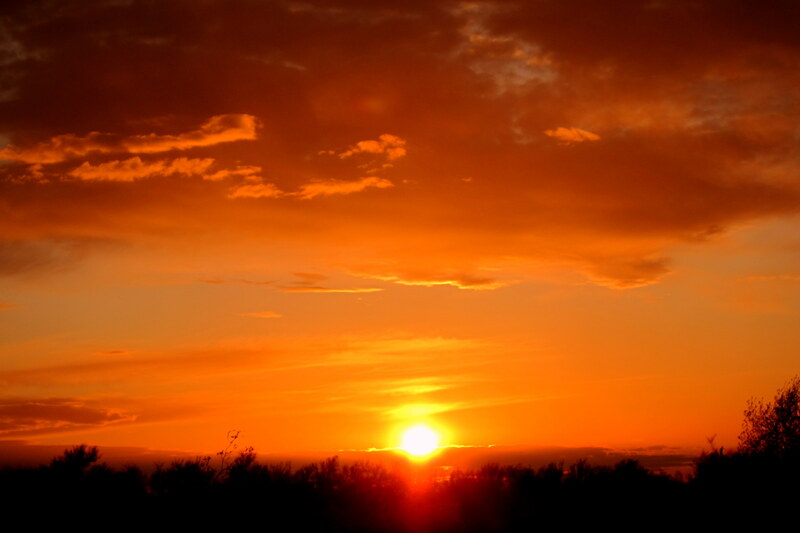 Being that this is the desert…..there are great sunsets however. Of course, this photo was taken midday after a too close bombing run…..just kidding. Thursday, February 16, 2012: Please see Wednesday, February 15, 2012. Friday, February 17, 2012: Up and on the road under clear skies and a temperature of 68 degrees. Kit and I had a “heated discussion” (if you know what I mean) on where to go next…..not who to see, but where to base our next stop out of. 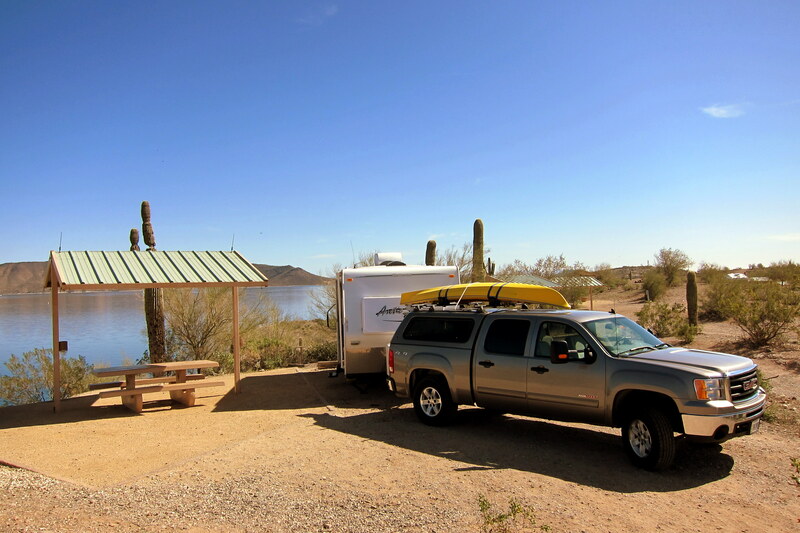 I was looking forward to spending a few days at Lake Pleasant Regional Park north of Phoenix and Kit wanted to go to Paradise RV Resort in Sun City. Decided to stay on US 85 but heading north in order to see some sights that we have never seen before. 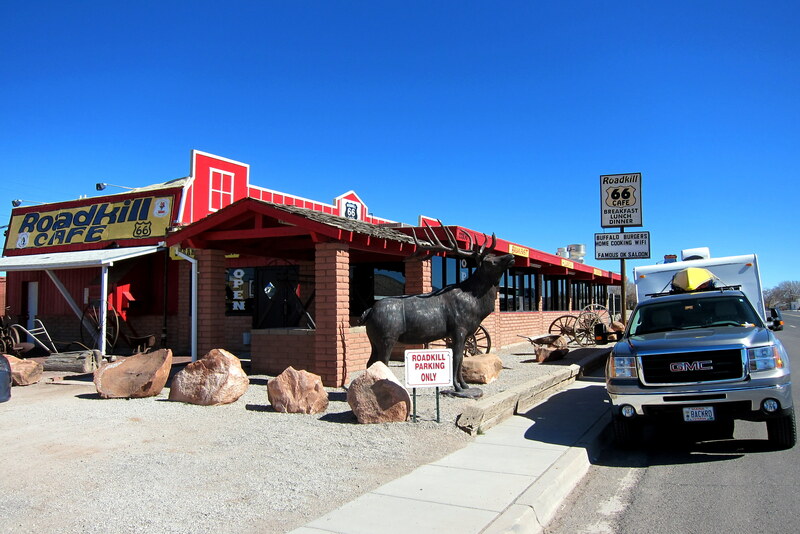 We quickly passed through downtown Gila Bend, population 2,800 and 5 old crabs…..according to the town line sign. Somehow we missed a turn and ended up on Old US-80 but since we were still basically heading northerly we motored on……besides, this road looked like fun! Soon we noticed a highway sign for Gila Bend Aqua Farm. 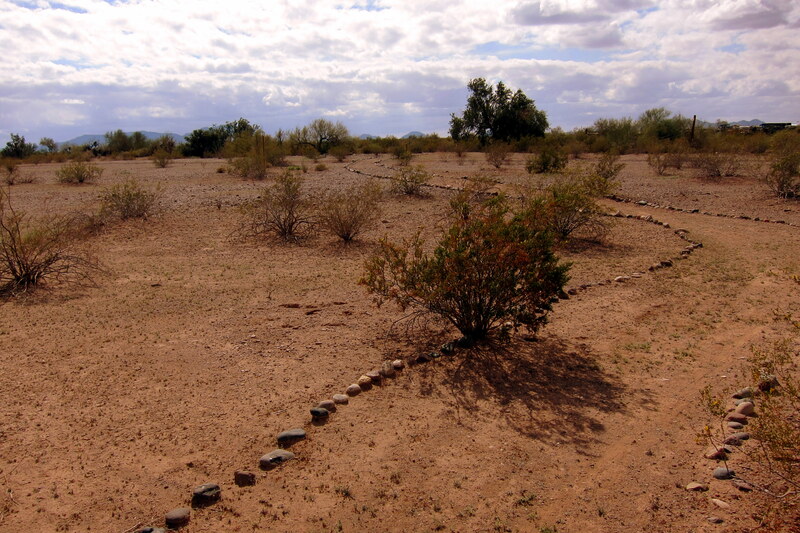 This is probably where H2O is planted, cultivated and harvested for use in this parched environment. I’m guessing they irrigate with sand as there is plenty of the stuff in these parts. 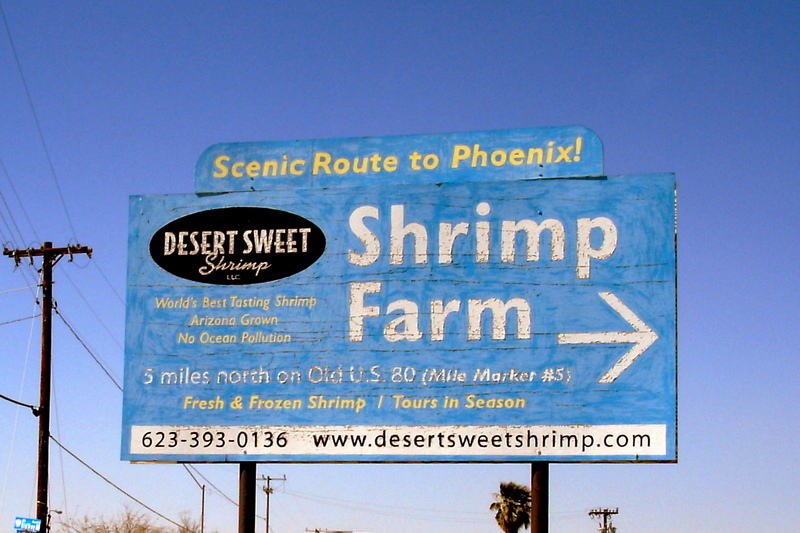 However as we neared the facility we noticed a sign that read: Desert Sweet Shrimp…..never heard of the stuff. And apparently they don’t grow shrimp in these parts…..so, if you invested in a shrimp fishing operation in the middle of the Sonoran Desert than you are S-O-L! A little ways down the road we started noticing green fields of cotton. Sharing the road with us were a variety of farm implements including truck after truck loaded with manure headed for the vast fields. Now, I’m no farmer…..but wouldn’t it make more sense to just let the cattle roam about the cotton fields and allow nature to take its course…..so to speak. Near Buckeye, Arizona we moved over to US-85 heading north and passed The Lewis penitentiary and the famed chain-gangs. Arizona’s hard line that require inmates to work and repay their debt to society is well known…..makes one proud to be an honest citizen. At 1545 we arrived at Paradise RV Resort in Sun City and set up for a few days stay. 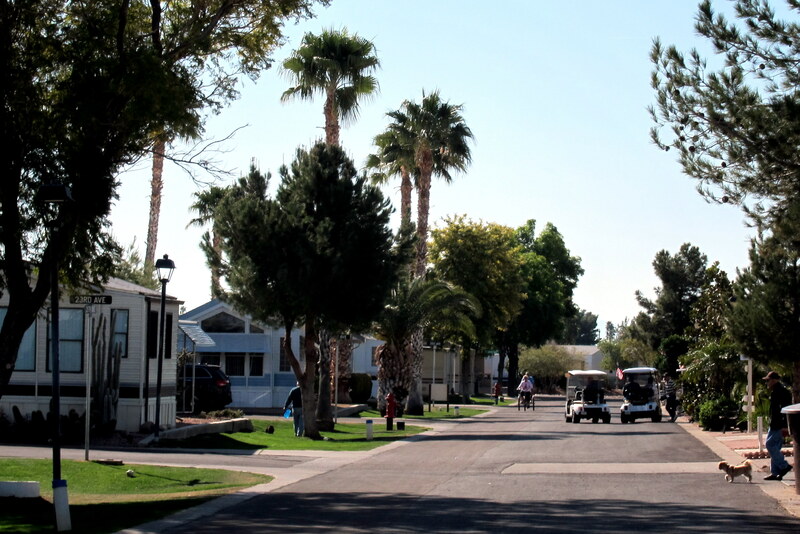 This place is a huge 5 star senior RV resort with over 850 sites, mostly year round vacation homes. It is nationally known for its wide selection of activities including, lawn bowling, swimming, exercise classes, ceramics, sewing, tennis, horseshoes, quilting, urn turning, shuffleboard, woodworking, and lots of cheap entertainment……some even intentional. 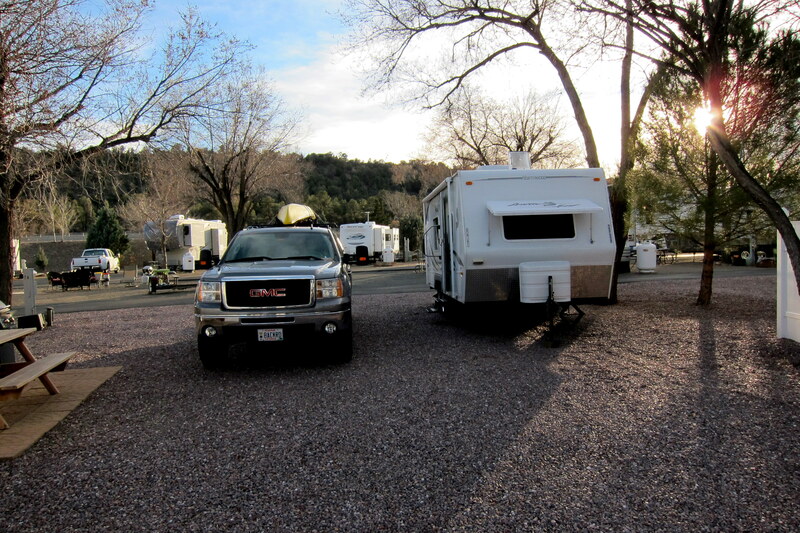 The minimum size of RV allowed is 24 foot…..however the management overlooked the fact that our little camper was only 22 feet and allowed us to stay anyway. We were given a site along the perimeter where the traveling RV’r is generally placed but still allowed to enjoy all the resort had to offer. After a nice trailer cooked meal we turned in for the evening…..tomorrow, it’s fun and games in paradise. Saturday, February 18 and Sunday, February 19, 2012: Woke to sunny blue skies and temperatures in the 70’s…..yep, both days! After breakfast we walked about to reacquaint ourselves with the place. The resort is laid out like a small community and most units are park model type trailers that are individually landscaped. The primary mode of transportation is walking, bicycle riding or for longer distances the golf carts. 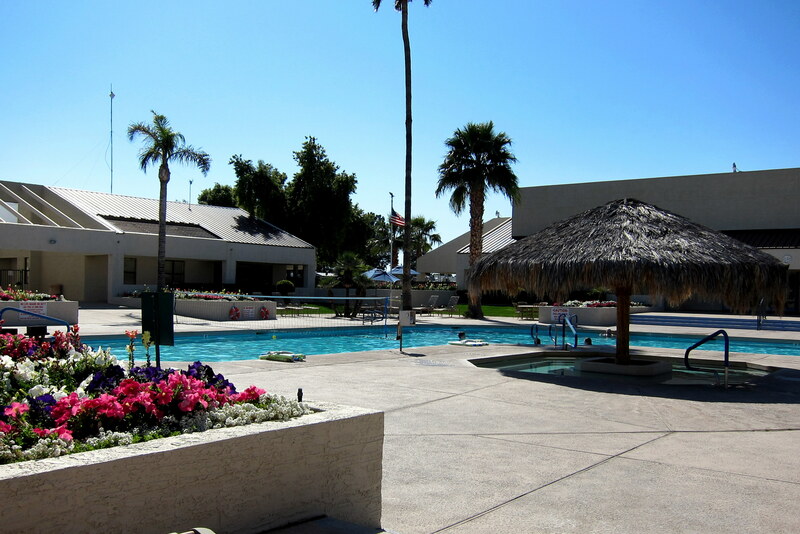 The pool area is very attractive and features a large hot tub, sauna and shower facility. 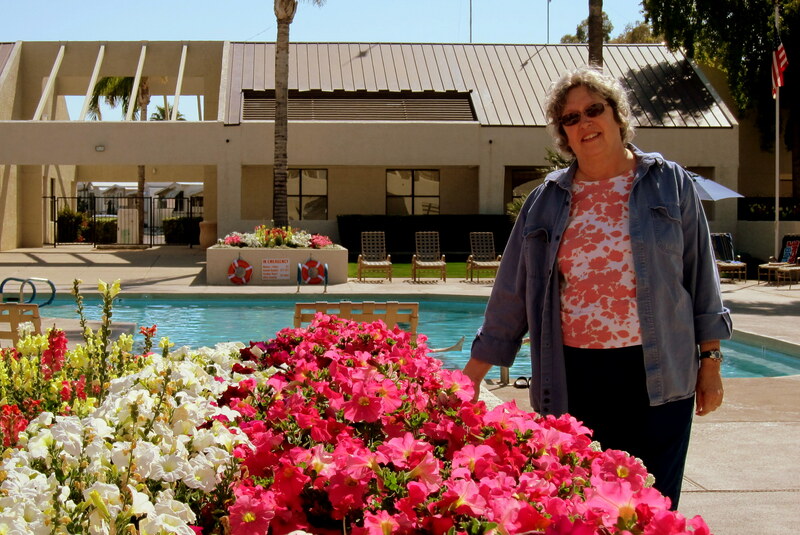 Kit especially appreciated all the colorful flowers that were in bloom and frequently sat poolside and enjoyed the warm breezes and fragrance. In this place you expect Truman Burbank to come walking down the street at any moment. Also, you may have noticed that occasionally one has to deal with traffic during the rush hour bingo commute. The first day in paradise we received a phone call from some expat square dancers about a dance that evening. So we donned our best western wear and headed out to allemande left the night away. 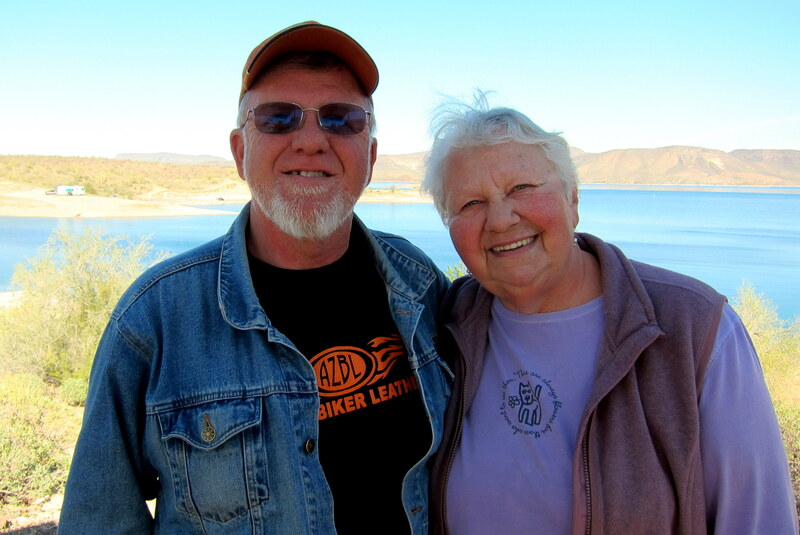 Martha and Tommy live in Sun City and are the main reason we made this city a stop on our travels. They came to visit us in Maine last year and we had a great time showing them out little corner of the world. Martha invited us over for dinner and conversation on Sunday afternoon. 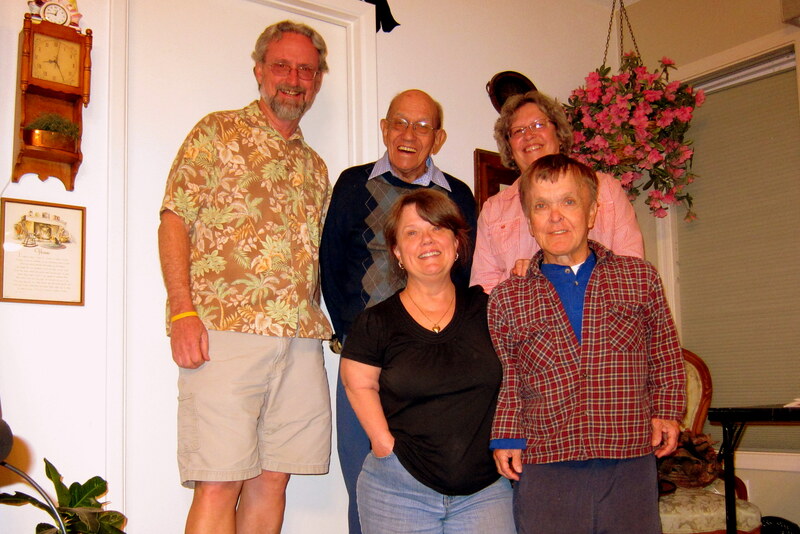 Martha’s brother Rodney and his wife Gloria visited us in Maine last summer as well…..unfortunately they were not able to travel from San Diego to Sun City and join us. However their 95 year young father, never one to miss a party, was able to drive over from his place a few blocks away. They have a very nice home right on the golf course. 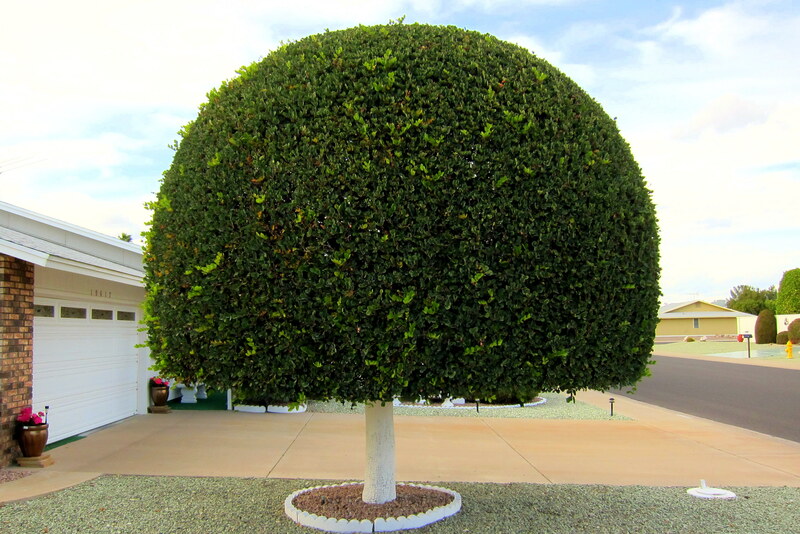 The landscaping is sculpted and well cared for…..this Carob tree looked as if it could have been featured in a Doctor Seuss story. Monday, February 20, 2012: Up and on the road by 1000 and heading north. 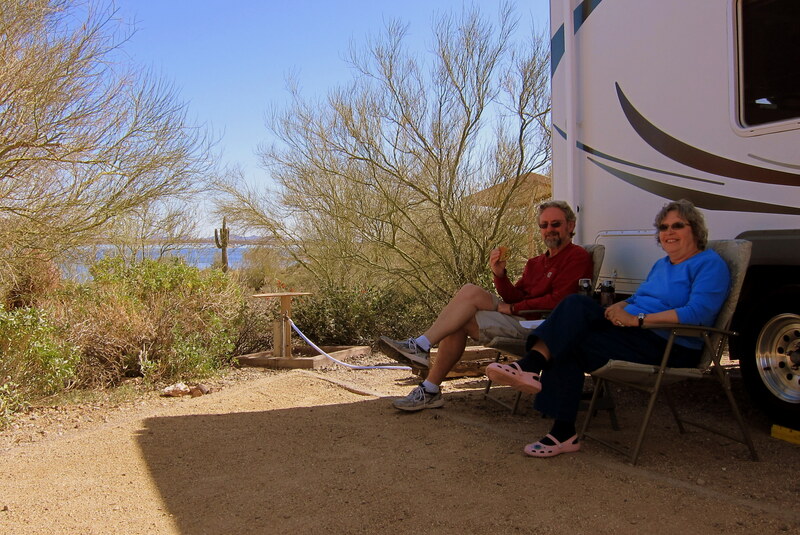 Since we got our “resort RV fix” I needed a “middle of nowhere camping fix” so off we headed toward Peoria, Arizona and Pleasant Lake. However as we left Sun City I got a bit turned around in ended up in Surprise…..yea kinda ironic, I know. Nice town however, looked to be another retirement community with mostly new developments and retail establishments. 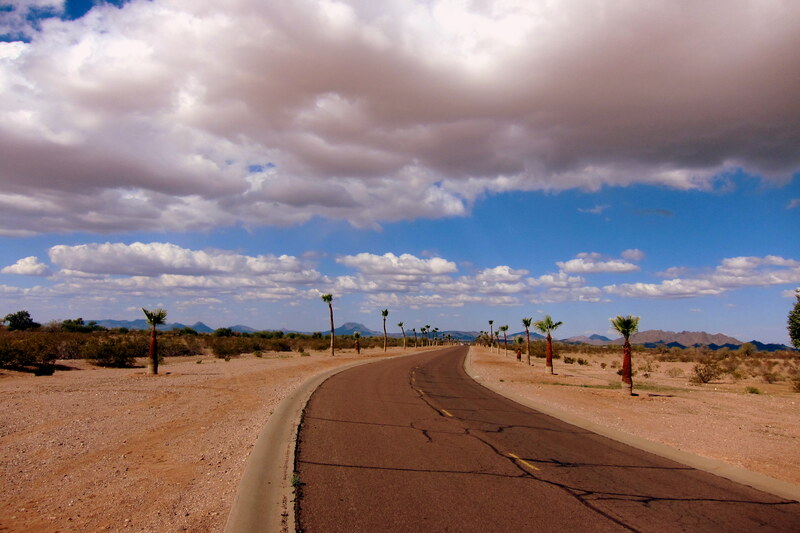 Soon we were back on track, on US-60 and heading westerly into a less populated area. Lucy was having a heck of a morning as she once again led us on a wild goose chase trying to find the access road to Lake Pleasant Regional Park. After a 22 mile detour we were finally on track and arrived at our next camping destination shortly after noon. 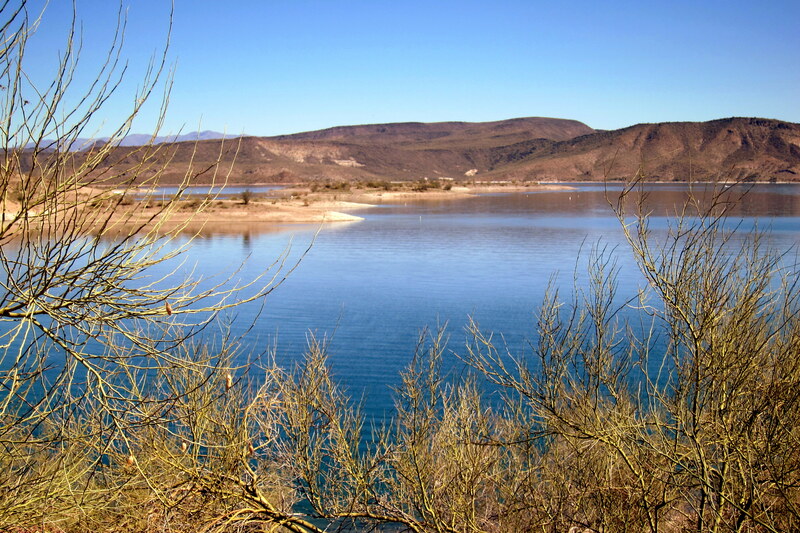 Lake Pleasant is an impoundment that provides drinking water, flood protection, hydroelectric power, irrigation and recreation to the greater Phoenix area. The 10,000 acre artificial lake is formed by a 4,770 foot long earthen dam and is partially filled by the Aqua Fria River. 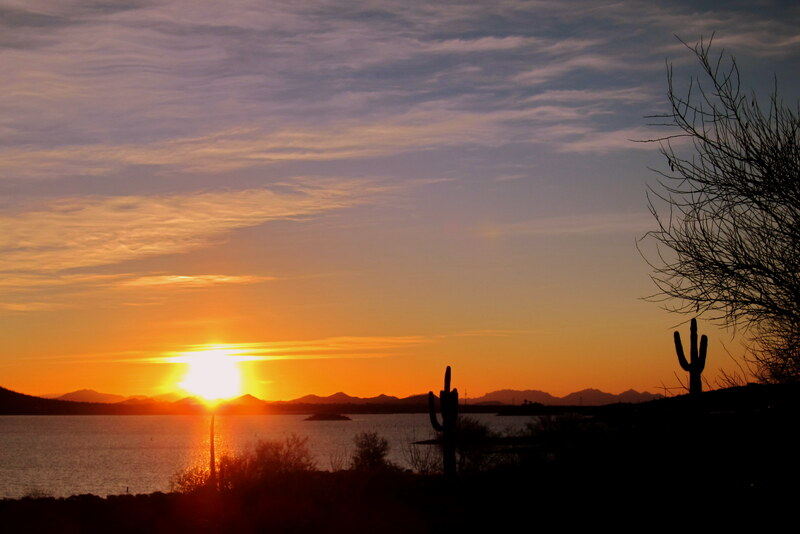 However, Lake Pleasant gets most of its water from the Colorado River 170 miles to the west via the Central Arizona Project Aqueduct. We selected a nice secluded campsite overlooking the lake with a trail leading down to the water’s edge. And became the proverbial “happy campers”. Where we entertained one of our neighbors…..or maybe he entertained us. I didn’t ask but I think he is in the insurance business. Tuesday, February 21, 2012: Decided to stay a second night so we could more thoroughly enjoy this beautiful lake. In addition, I was overjoyed that I could finally use the kayak I’ve been toting around for the past 6 weeks, well other than sliding down sand dunes. Being an impoundment the lake had many interesting coves and inundated villages to explore. And being sheltered by the surrounding terrain the lake surface was mostly calm and glassy smooth. I used to think that few places in this country had clear clean water like back home in Maine. 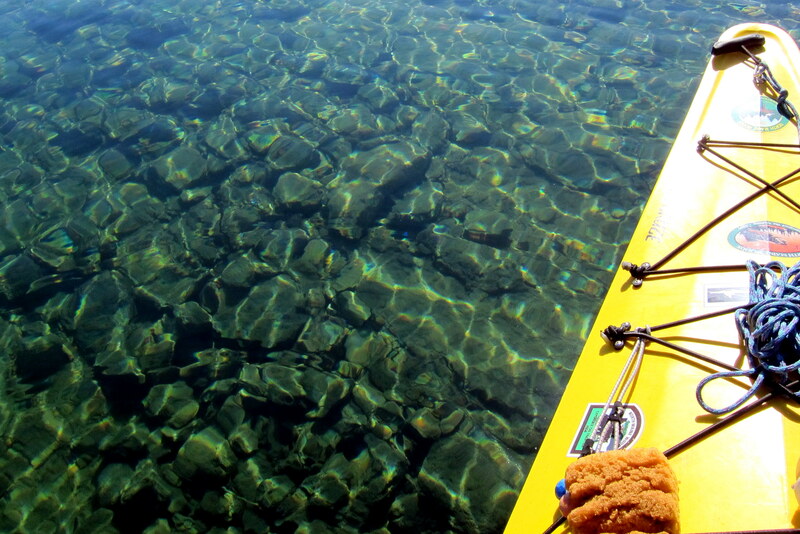 However on many kayak paddles out west I’ve discovered that the water here is just as clear. 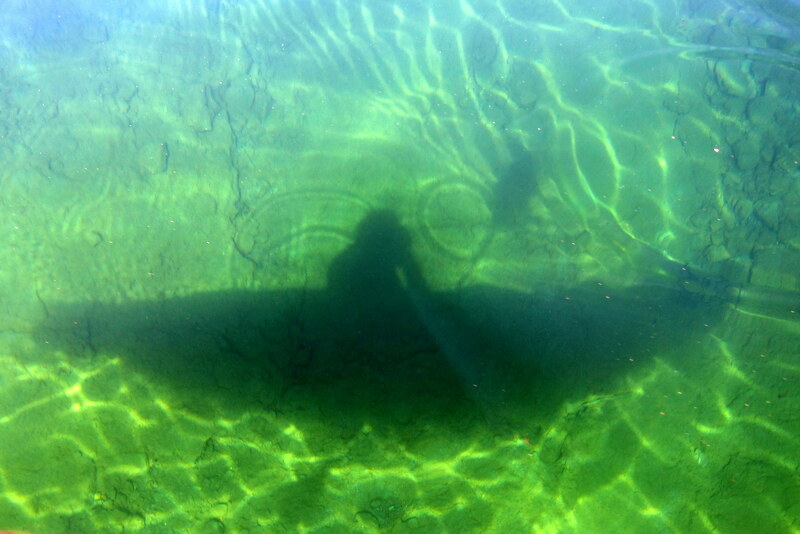 Here is an unusual shot of me and the kayak reflecting a shadow on the lake floor some 10 feet below. One afternoon we had the resident Camp Host drop by. Usually when this happens you’ve done something wrong. However his statement caused us to scratch our heads when we announced: You guys have to leave…..this campground is only big enough for one Maine couple and we got here first”. Come to find out, Bill and his wife Doris were from the town of Topsham, Maine which is just on the other side of the river form our town of Brunswick. And to top it all off…..Doris is a retired RN from Mid Coast Hospital and worked for many years with our daughter, Kim. Indeed a small world! We had a very nice and relaxing time on the shore of Pleasant Lake but tomorrow we must continue on our trek north. Wednesday, February 22, 2012: Woke up to an incredible sunrise streaming through the window of the camper…..well, at least one of us did. Moving about a bit slow this morning as I must have torqued my back a bit when climbing in or out of the kayak yesterday. Oh well, a few ibuprofens and I should be good to go. After dumping tanks we were on the road by 0930 under partly cloudy skies and a temperature of 59 degrees. 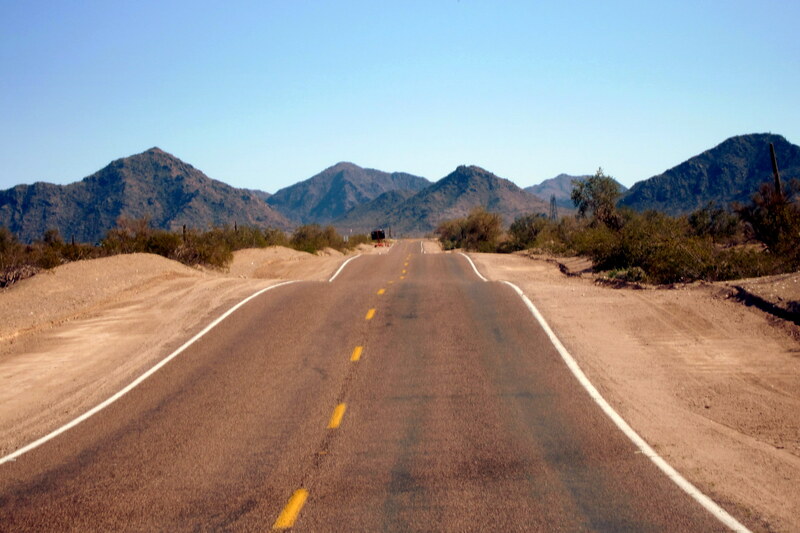 We selected US-17, The Arizona Veterans Highway, and headed north. Passing through the towns of Ele and Mesa we then moved over to US-69 and continued north through the town of Mayer arriving in Dewey, Arizona shortly after noon. 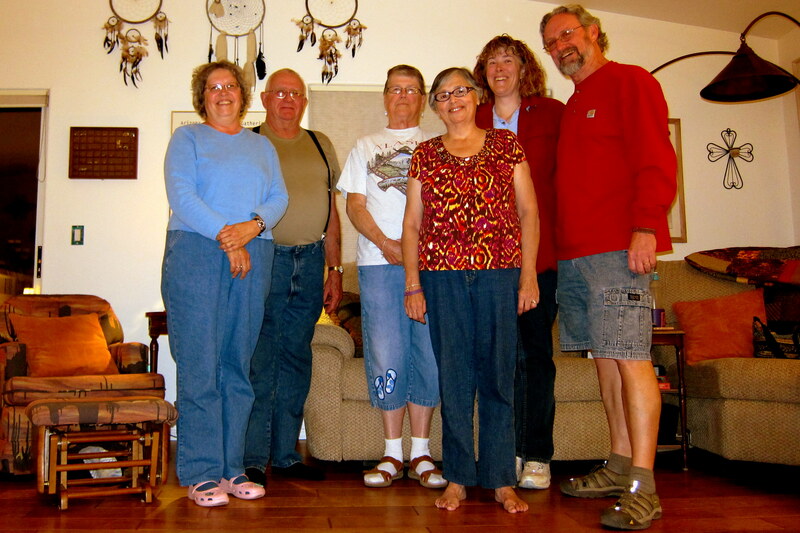 Since the town of Prescott, our intended destination, was just down the road, and since we thought it would be fun to stay in a town named after my favorite bruzzin…..we pulled into The Orchard RV Resort in Dewey and set up camp for a few nights. 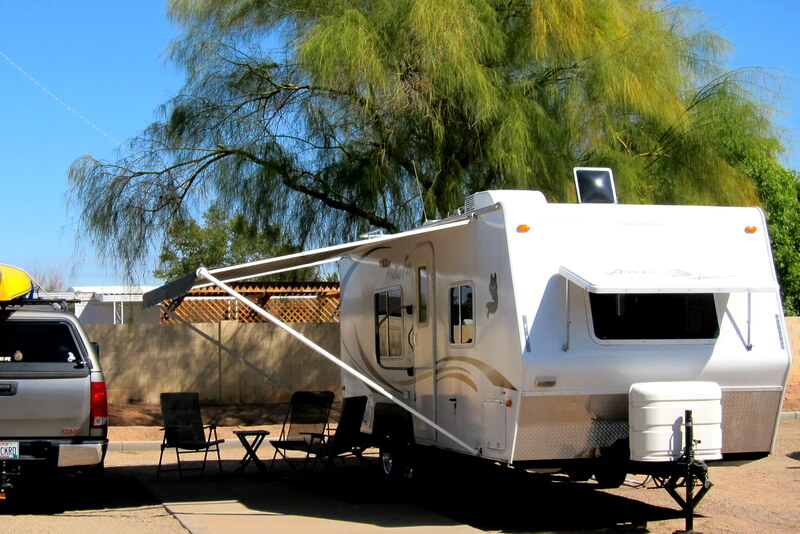 This park, like the Paradise RV Resort in Sun City, is a senior park with primarily park model trailers and modular homes. 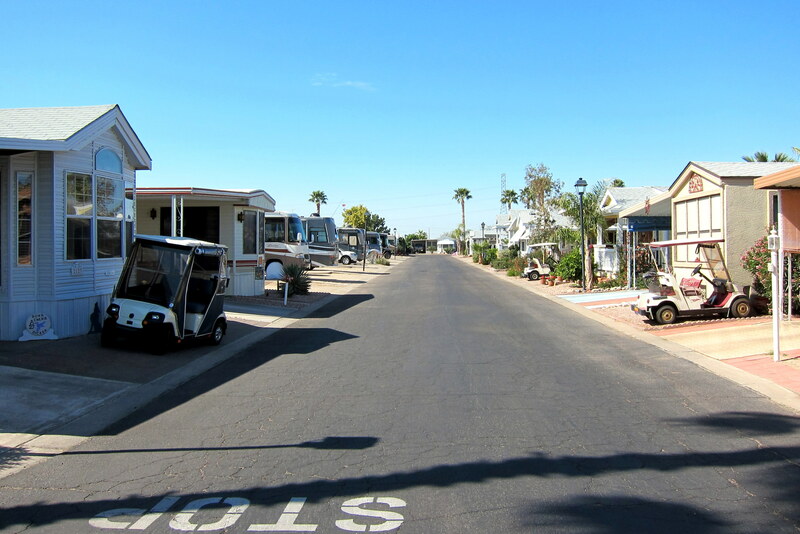 We took a tour of the newer portion that was being developed and the facility impressed us with its affordability and amenities……not as fancy as Paradise RV Resort in Sun City but more rustic and a whole lot less expensive. Thursday, February 23, 2012: Up to cool 50 degree temperatures under sunny blue skies. This area is considered high desert and at 5400 feet elevation they occasionally get snow. The temperatures dipped below freezing overnight but quickly recovered come sunup. There are a number of Maine expatriates that have resettled in this area, mostly in Prescott and Prescott Valley. 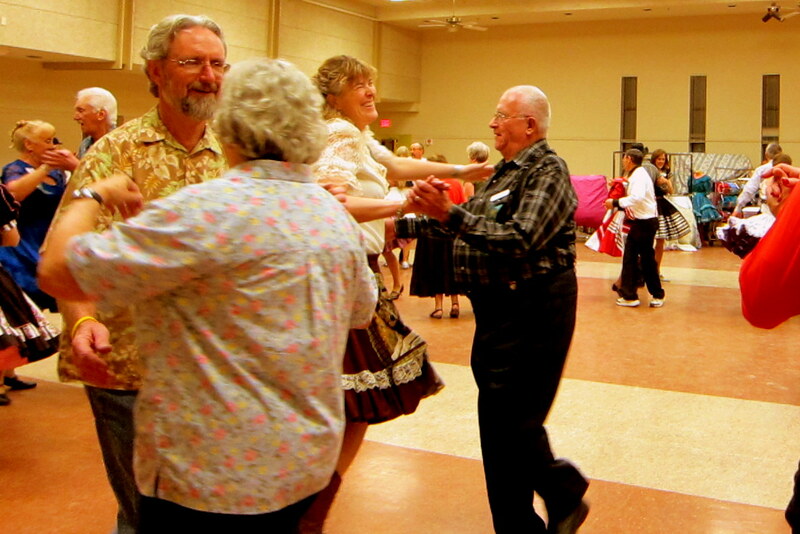 Ironically most of them are friends from our community of square dancers. Nancy, originally from Portland, Maine just moved out here this past fall. We had a great time seeing her new digs and catching up on all the news. Also, Terri and Charlie as well as Mary and her mother Cindy have been here for a few years and we had an opportunity to visit with them as well. All seemed pleased that we made the effort to stop by on our way north and spend a few hours with them. We certainly were pleased to visit with them as well. Friday, February 24, 2012: Up and on the road at 0950 with sunny skies and a temperature of 41 degrees. We are very excited as today we finally reach Nevada and the home of our youngest daughter Suzie and her family. 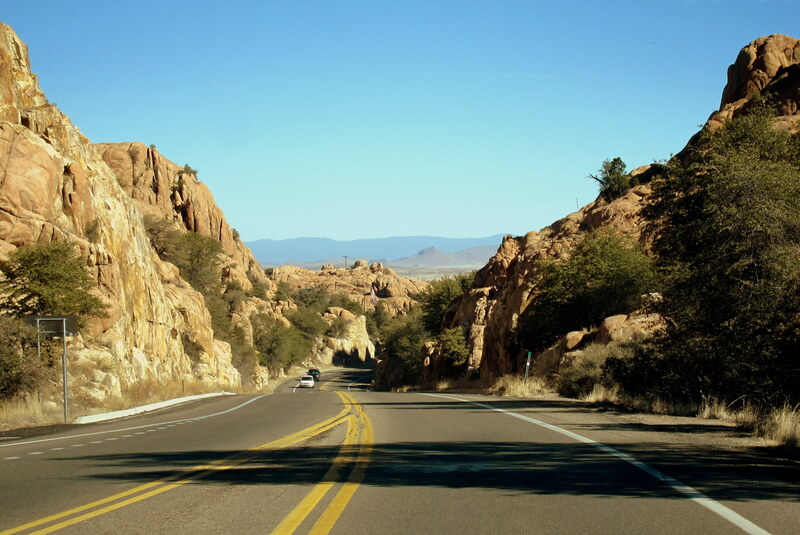 Driving north on US-89 we enjoyed the unique topography of the Prescott area. Just as we rounded a corner, we spotted a coyote saunter across the road. Were you trying to find the critter in the photo above? Well, don’t bother…..I couldn’t get my camera turned on fast enough to capture the fellow. An hour later we entered the Kaibab National Forest and noticed more evergreens and very little typical desert plant life. Leaving the mountains we soon reached I-40 and headed west. 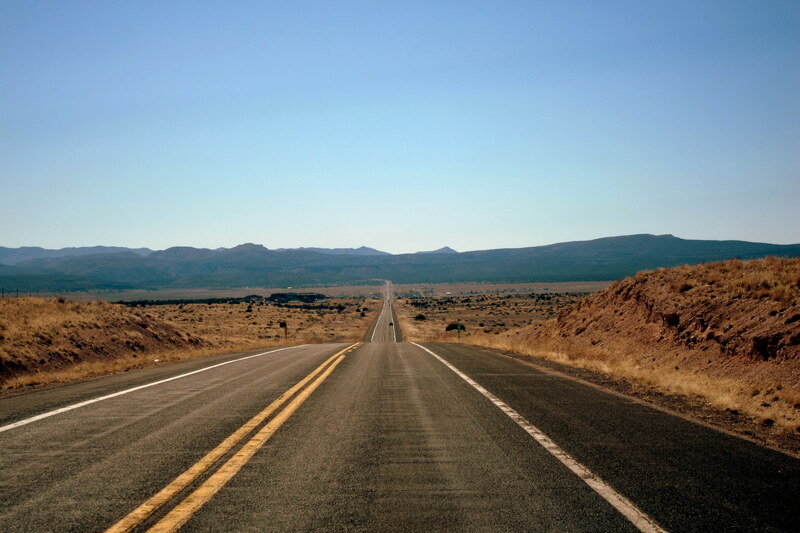 After an hour of making great time but being bored out of our skulls, we noticed that US-66 still exists in the area and basically heads in a westerly direction as well…..so off we went to get our Kicks on Route 66. Just before noon we pulled into the town of Seligman, Arizona, a once thriving town that virtually dried up and was reduced to a mere 400 hardy souls after Interstate 40 was constructed further to the south. Main Street, which doubles as US-66 is wide with plenty of parking space. We found a convenient place to park for a walk about town and grab some lunch. The aptly titled Road Kill Café seemed like an interesting, and convenient place to eat and it was! Now, folks up in Maine enjoy eating at Road Kill as well. 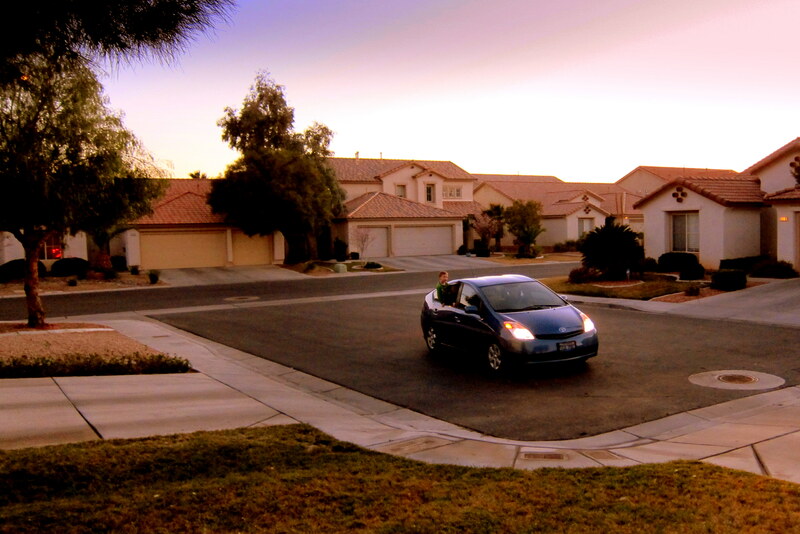 However, there, it takes at least three people to enjoy the meal…..two eating as the third looks for any oncoming cars. Actually there is a Road Kill Restaurant up in Greenville, Maine with an interesting menu. However, I’ve learned the hard way to never assume that the garnish is actually raisins. Leaving the café, we discovered the truth about a prominent political figure. 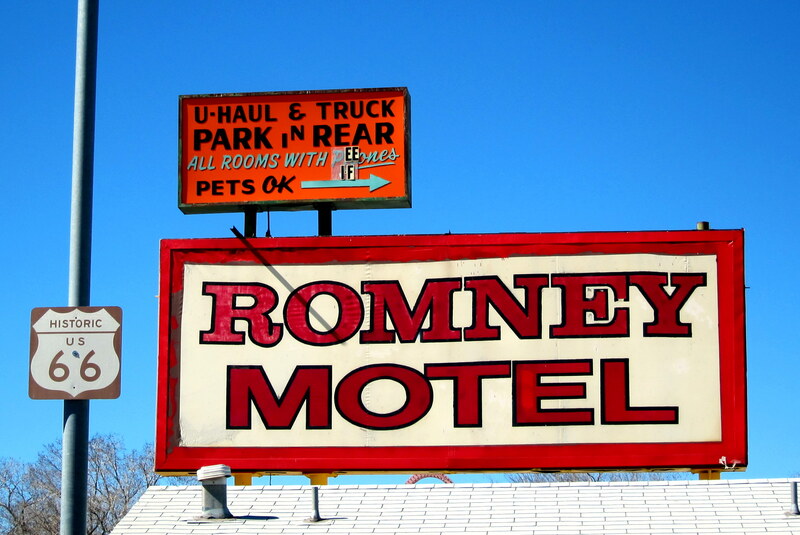 The press has it all wrong…..Mitt did not make his fortune with Bain Capital but as an innkeeper here in Seligman, Arizona. And, as with most politicians, he requires one to park it in the rear. After lunch, we walked the two block downtown district and stopped to visit with a couple of the towns more interesting, and animated, inhabitants. 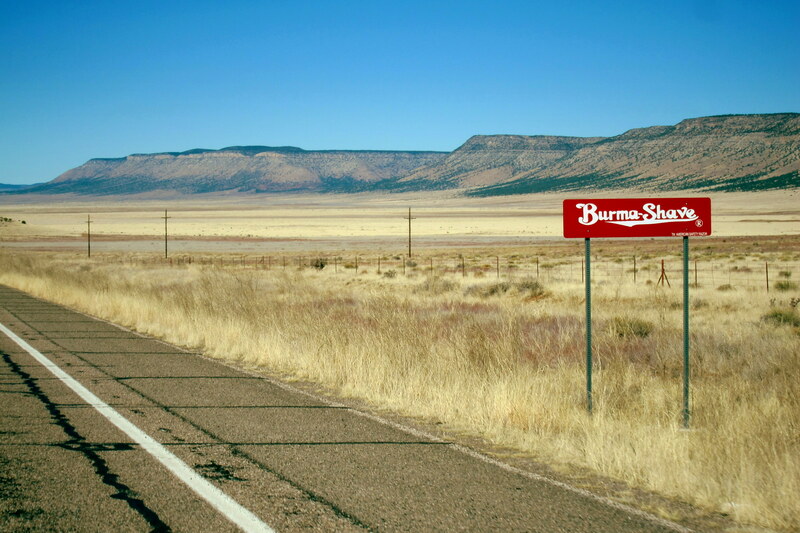 Following an enjoyable time in Seligman we continued north on US-66 and I began to wonder…..what ever happened to Burma-Shave and their entertaining roadside signs? Oh, wait a minute…..never mind. Driving along historic Route 66 we both speculated that our parents used this main artery to travel from the northeast to the coast back in the 1950’s. We wondered how much, if any, the topography had changed. Arriving in Kingman we once again had to move over to I-40 in order to head toward the Nevada Border. However, one of these days we intend to retrace the entire US-66 highway from Illinois to California. Descending from the high desert of northern Arizona into the Colorado River valley we soon crossed over the Pat Tillman & “some Nevada politician” Memorial Bridge entering the state of Nevada and the Pacific Coast Time Zone. As you may recall, Pat Tillman from Arizona was a true American patriot who gave up a lucrative career playing professional football to serve in the military and ultimately made the supreme sacrifice. 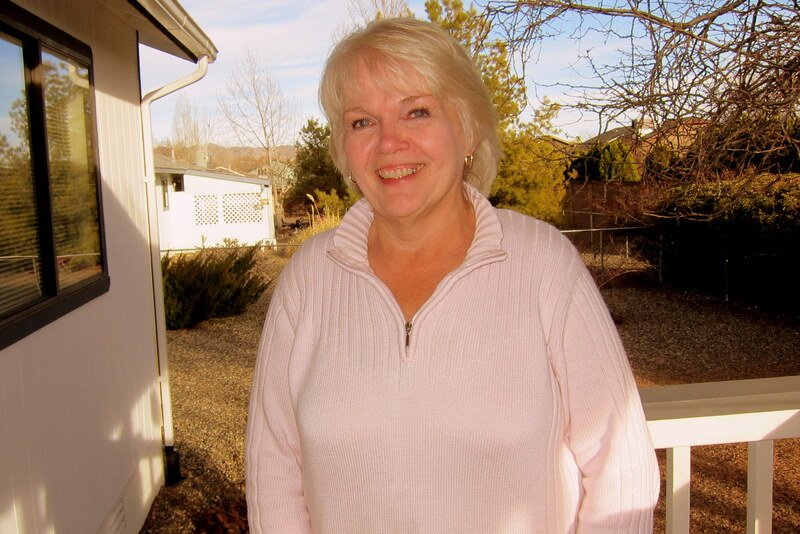 The “politician from Nevada” was, um well…..just another politician on the public dole. At 1730 we rolled up to our daughter Suzie’s place in Las Vegas and anxiously waited for her to arrive with our two youngest grandchildren, Jack and Tucker. Within a few minutes they came around the corner to much celebration. This officially starts our three week stay in the Las Vegas area to enjoy time with Suzie and company. Kit’s Corner: Imagine our surprise, when Bill & Doris came to greet us at Pleasant Lake Camp Ground! Usually, it’s us scouting around a new park to find some friendly faces. Here, they found us (after reviewing our sign in paperwork) and what a SURPRISE it was! I was on the phone with my sister at the time and I kept hearing familiar words outside. Going out to check things out, I discovered one of Kimber’s good friends from MCH. We spent a couple of hours getting re-acquainted and comparing notes. Also noteworthy was our arrival at Suzie’s house. We always text our ETA when we get close so she was right on time bringing the kids home! Both kids were so excited, she let them climb out of the car to run up and greet us with big hugs and kisses! How’s that for a Great Welcome!! The calendar says we have 5 more days of winter left. A fresh dusting of snow on the ground this morn reminded us of that fact. Enjoy your stifling heat! Hope you get more yaking in. From what I hear, it hasn’t been much of a winter. Hope the spring rains arrive to green everything up and fill the lake……could be an interesting summer otherwise. Take care, tell that good looking redhead and those two neat kids we said hi! appears that you already have the latest weather report, just a dusting of snow and a bit brisk. when i first read the 2/22 am report, thought you had written steaming and blamed the soreness in the back to the kayaking on 2/21. be careful not to mix up the meds, viagra are blue, ibuprophens white. Good morning…..thanks for the comment. Yea, it has been a strange weather year across the nation…..sometimes it is warmer in Maine than here in the southwest. Thanks for the tip on medicinal coloration…..Kit thought it was hilarious! However if one did get confused at least their back would be straight. 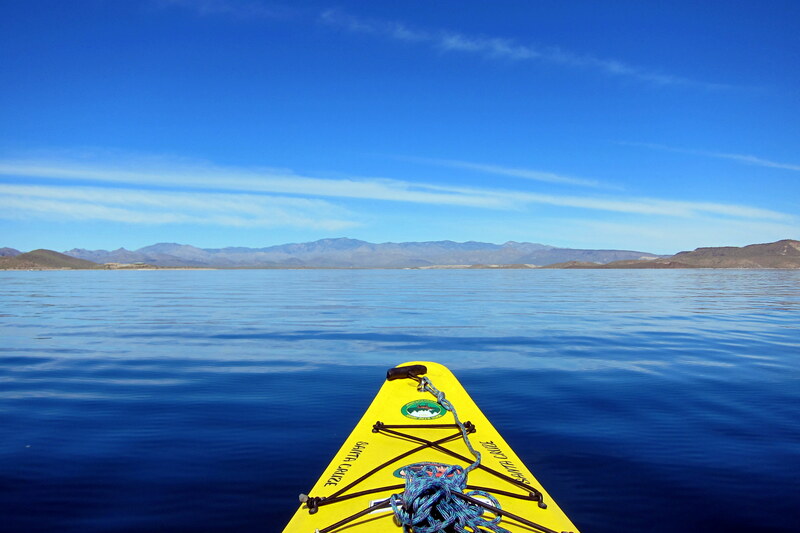 We always marvel at your adventures…thanks for sharing!!! BTW..don’t let that ‘dusting of snow’ as mentioned in the previous comment fool you. Temps here have been in the 50’s and 60’s and have already played my 1st round of golf!! We normally would be snowshoeing..or worse than that, shoveling this time of year! Hi folks…..thanks for the nice comment. While on these trips we always keep daily watch on the weather back home. Normally we can be a bit smug…..however, not this year. There are times that it has been warmer in Maine than here in the southwest…..strange weather, hope it doesn’t snow in July! Love you as well, please say hi to all our Sage friends for us…..looking forward to seeing you sometime this summer. Bill, You really should consider a career in photography too! The kayak pictures were fantastic. I’ve seen pictures of that quality in the Arizona Highway magazine! Great job as always! Hi Kathy!!! Thanks for the nice comment. Ninety percent of my photography success is the subject matter. Case in point, I think that was a great photo of you in Journal #7, and the remaining ten percent is taking a ton of photos and deleting those that don’t look right. Great visiting with you, take care and hope to see you back home in Maine this summer! We too have left I-40 to travel on Route 66, but we did it in Texas driving a 38′ motorhome (which BTW is sold – closing tomorrow) towing a car. All of a sudden we came to a sign that said “Road Ends” and it did, abruptly, right there! No place to turn around and you can’t back that rig up when towing a car. Sterlin just took off cross country to I-40 which was a few hundred feet to our left. Sandy was behind us driving another car and she followed right along! So you never know just what “good ole Route 66” might do . Great adventures, though. 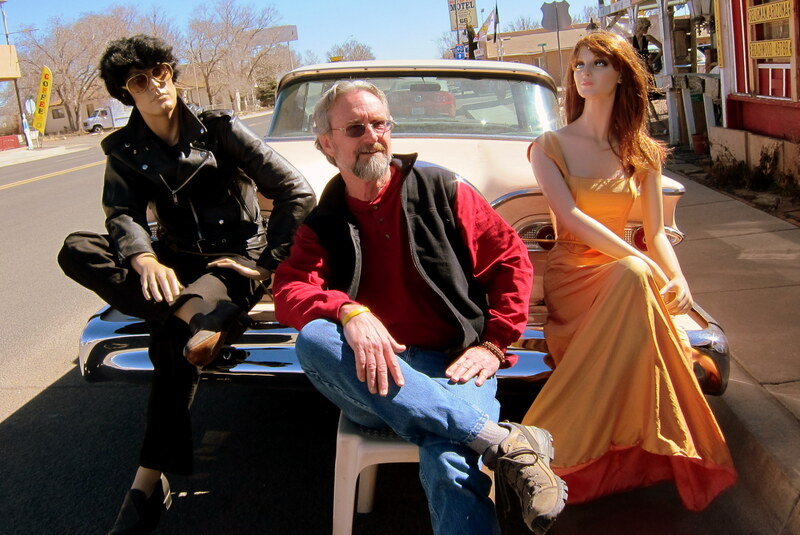 Thanks for the comment and for sharing your adventures on the fabled Route 66. 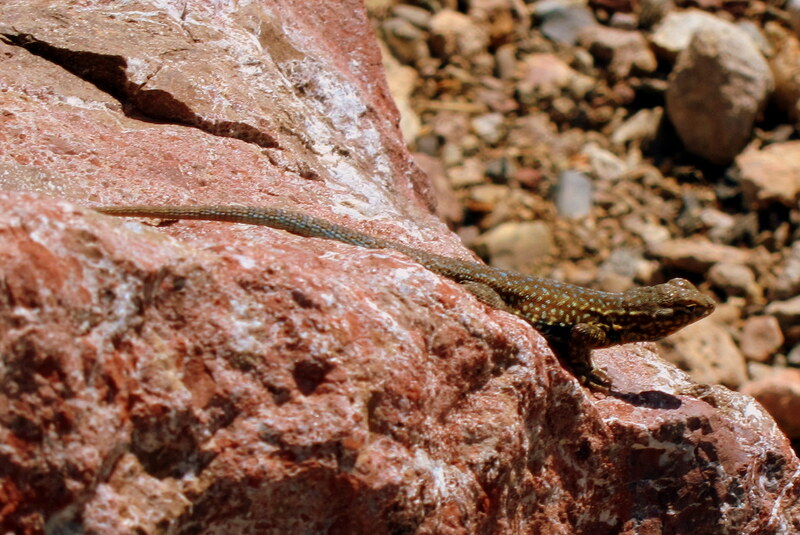 Finding adventure on the road is sometimes too easy…..usually adventure finds you! No not at all…..your dads commentary on our travels is insightful and extremely funny. In fact I’m living a dream with that man, without him my life would be an empty shell. I truly worship the ground he walks on and always try to ensure he has every possession that his heart desires, even if that means that I may one day have to return to work…..he is so worth it! Wow — as if reading and looking at the saga were not enough. Even the comments are a story in their own right. I kinda got caught up in the Gila Bend Aqua Farm H2O thing too. I’m just wonderin’ if that is a tree fruit or perhaps a tuber of some sort. No matter I will try to be on the lookout for these anomalies around here. Could be a new way for Poland Springs to make a buck or two. Thanks for the stories, really! Oh yea…..I guess it should be spelled yeah. However I have this theory that some folks many years ago made up a bunch of words and how to spell them, however what made them correct? I’m on a mission to free us from the tierney that Noah Webster, and others of his ilk, have unwittingly thrust upon us. I propoos wee al spel werds da wey wee wont to. OK…..just kidding, actually thanks for the input, I’ve been spelling that word that way forever. In addition, it’s nice that folks such as yourself read my ramblings careful enough to pick out the errors! Hi you guys! !….Enjoying your travels, you certainly stop at interesting places, enjoy all your photos. Nice weather here in Maine in the 60’s today!!!! Looking forward to IPOA in a few weeks and looking forward to seeing you soon!!! 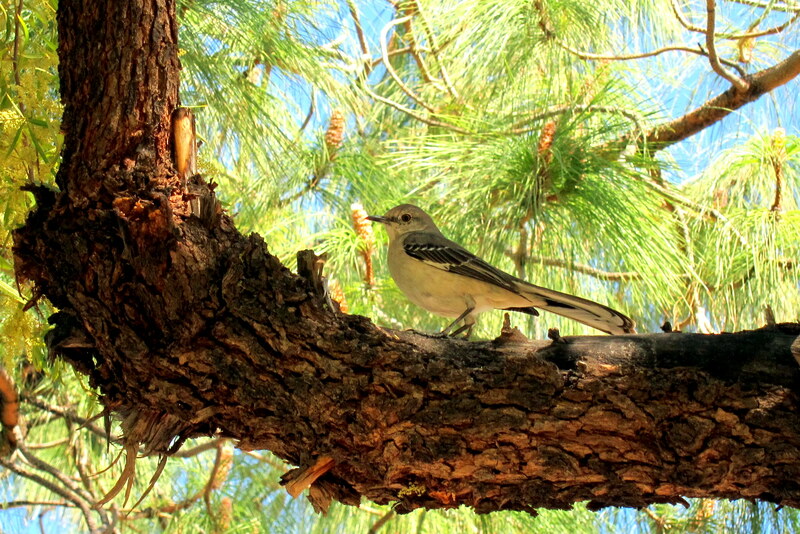 Hi right back and thanks…..we are still enjoying being on the road. The weather is CRAZY…..when it was mid 60’s in Maine it was in the mid 40’s here in the southwest! Take care of yourselves, looking forward to seeing you at the lake this summer as well. It is a good thing that you have a couple of week delay in your blog, otherwise it looks like in addition to being bored driving along I-40 you would have been stuck. I just read that about 180 miles of I-40 is closed today because they got about a foot of snow. I enjoy reading about your travels. Keep the stories coming. We noticed on the weather report that snow had closed a big chunk of I-40. Snow in northern Arizona is not that unusual…..what is strange is near 70 degrees in Maine, in March…..crazy weather! Mom really enjoyed seeing the old family photos you sent…..thanks again. Hope to see you all sometime this summer. 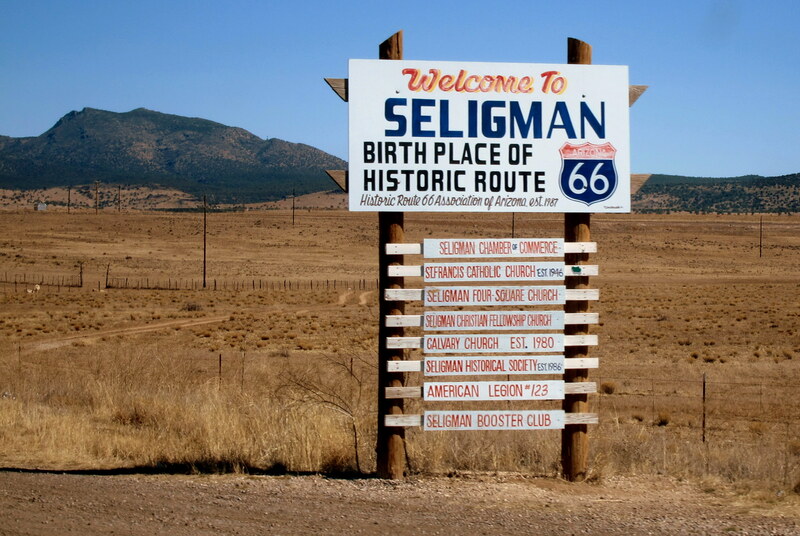 I would like to ask you if you would kindly grant me the permission to use your photo of the “Welcome to Seligman” Sign for a desktop wallpaper project that I am working on? I do not make money out of it; I just want to share my work with other Starbucks mug collectors. I will give full credits in the wallpaper design. Please let me know. You certainly may use my photo of the Seilgman sign for your project. I looked at your work…..pretty impressive! Would you like me to e-mail you a higher resolution copy of that photo? Good luck on your project, I’ll check your website later to see how the.wallpaper image turned out. Thanks, Bill! If you don’t mind, could you send me the higher resolution copy to victorwong at magicketchup dot com? By the way, what information should I put in the credit footnote? Sent photo to your e-mail address…..apply crediting as you see fit…..let me know if you need anything else.